I’m taking the JLPT N3 this December. I’ve never taken a JLPT test before, and I’m not sure if my level is near N3, but I have enough time until then to formulate and stick to a good study plan. The Japanese novels I have are limited, but I’m going to make use of the few I have in conjunction with online sources. The first book I’m using is Read Real Japanese (Essays). There is also a version with stories, but I prefer nonfiction. The Japanese page is on one side and the English translation of that page is on the other side. At the back of the book is a dictionary with the words that appear in the book. This book isn’t specifically aimed at any JLPT level, but I appreciate the detail that the notes go into and I love learning words from a variety of sources. I am also using official JLPT N3 practice books and do the reading tests from them. Reading is challenging to me just because of how much content there is to get through in a limited amount of time. Here’s an example of what an official reading test looks like. I’m a very hands-on learner and like to write, so after I’ve read the piece, I like to write it down. I like to read for an hour or so before I sleep. Usually I read books in English. I have quite a few novels and nonfiction books from Japan, so I think now is the perfect time to push myself to read them. I’ll read with a highlighter and highlight the words I don’t know, and look them up in the morning. Currently, I’m reading 考え方のコツ. JapaneseTest4You has lots of JLPT activities catered for different levels. I’ll be making use of their N3 Reading practice tests to make sure my level is on par with the standard. I’ve noticed I read rather slowly out loud (much faster in my head), but I’m concerned about my reading speed for the test. It’s important to read fast but retain information so that you’re able to answer the comprehension questions about the section. I need to learn to read faster and more accurately! Every time I encounter a word I don’t know, I’ll write it down and make sure I know the correct stroke order. I’ll transfer it into my N3 vocabulary book and review it often. I don’t like flashcards, so I’ll stick to vocab lists on paper. It’s key to remember not to memorize single words. The best way to get Kanji in your memory is to learn it in the context of a sentence. For that reason, I prefer writing longer sentences down than single words when I’m learning new Kanji. Then since I love example sentences, after learning the Kanji I will go on either tangorin or weblio and look for sentences that are at my level and one or two above my level. While doing that I’ll often encounter a new vocab word or kanji and then kind of do the same process for that word. One of the best websites I’ve found for Kanji is renshuu.org. I need to make a conscious effort to use it more, though! Renshuu has quizzes, games and goals you can set for your Kanji learning. You can select which level (JLPT or Kanji Kentei) you want to review. I am using the textbook called Kanji Isn’t That Hard! which I checked out at the library at my local Japanese Embassy. I can see the book is for beginners as it uses pictures to illustrate how the Kanji is built up, but what I like about it is that it explains the build of the Kanji in both Japanese and English. So just by reading the explanation of the character, I also learn new words. In my Kanji notebook, I write down the character, it’s stroke order, and the kun/on-yomi. I practice writing the character over and over until I don’t have to think about which stroke comes first or last. It should be a natural hand movement without too much thinking. Sometimes this means writing it 5 times, sometimes 50. I make sure to say the pronunciation of the Kanji while I’m writing it. For other vocabulary acquisition, and since I like to learn through conversations and context, I’m using Japanese For Busy People III. It’s not specifically catered to JLPT N3, and it’s actually a bit easier than N3 would be, I think, but it’s great for a holistic approach to Japanese learning. Each chapter has a main conversation, and then it goes over grammar points with lots of practice exercises. At the end of each chapter is a Kanji section. 1. I’ll be using the app Goodnight to practice Japanese, although it’s mainly used by Taiwanese people. Some Taiwanese people on the app speak Japanese too. I found a good friend who lives in Japan and though he’s Taiwanese, he’s on N1 level. We speak Japanese together. Talking to someone on N1 level is great because they’ll use different vocabulary than someone on my own level would. 2. I might also use the app Saito-san to broadcast in Japanese. You can have a little broadcast room and viewers can join while you speak about various topics. I did this a few years ago and you can see my video of it here. I changed Spotify, Facebook and Instagram to be in Japanese, and I also set my phone language to Japanese. I have a separate Twitter account for tweeting in Japanese and following Japanese accounts too. Finally, I’ve gone as far as labelling all the folders on my laptop in Japanese. This won’t guarantee me passing JLPT N3 of course, but just seeing Japanese and seeing Kanji every day helps remind me what my goals are. I’ve labelled my laptop folders in Japanese! My planner notes are all in Japanese, and I often write my shopping lists in Japanese too. This helps me use Kanji I wouldn’t normally write out, and also helps me learn new words when I need to explain something in Japanese. 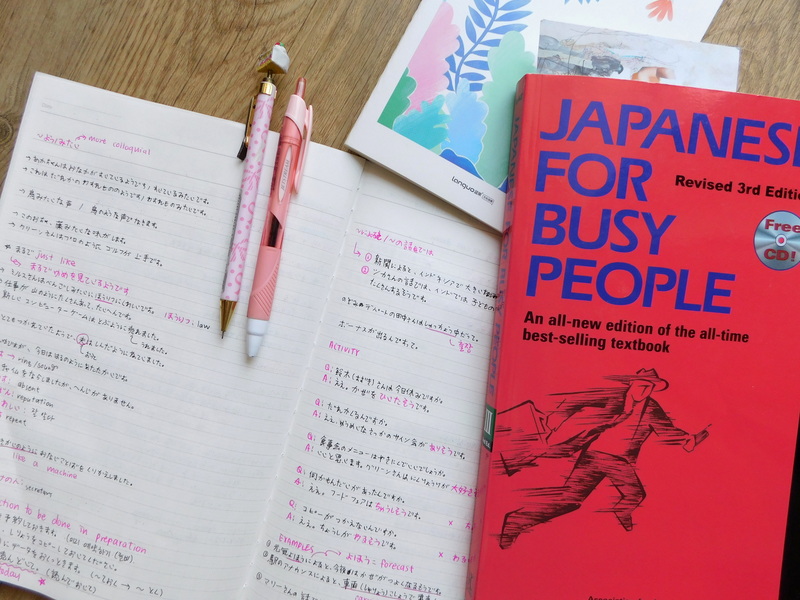 Because I have a fulltime job, and I tutor languages after work, I don’t have enough energy or time to dedicate a specific amount of time to JLPT study each day. In fact, if I tell myself to learn 10 words a day and finish one lesson from a book a week, I’m going to stress myself out a lot more. I prefer a more haphazard approach, studying when I feel up for it, and then giving it my all. Of course, consistency is key, so it’s important that I do something in Japanese each day (like listening to a podcast at work) instead of ignoring the language until I feel like it. You sit at home and read your textbook, get all the questions right, and speed through your Duolingo and Memrise apps… but then once you have to talk to a native speaker, suddenly, you have no idea what they’re saying! Why is listening so hard? Remember, listening is one of the most important aspects of communication. When you were a baby and you learnt your native language, did you start speaking immediately? I’m pretty sure your mom didn’t put a textbook in front of you when you were learning to say “mama”. You learnt by listening to her, right? That’s the process we need to adopt. In many languages, I prefer to listen to the language way before I dive into learning how to speak it. This way, I’ve come up with 6 techniques you can implement to improve your listening comprehension in any language. If you use Siri, you can change the language she talks in. What’s great about Siri is that what she says also appears in text. Siri has also been programmed to sound like a natural in each language, so you might notice subtle differences in intonation, humour, and formalities in each language. Additionally, change your phone language to your target language, and your phone GPS should start up in that language. I learnt the words for “left” and “right” in Hungarian by listening to my GPS – I didn’t even have to look the words up once! For Chinese, I like to use the app called Goodnight. Many Taiwanese people use this app, and since there’s no video feature, it’s purely a voice chat app. It’s great to hear how people answer the phone, what things they normally say when starting a conversation, and of course, to get used to natural pronunciation and filler words. For Japanese, there’s an app called Saito-san. It does have a video function though, so be careful for people who are there for PG-18 reasons. I don’t recommend it for younger learners. If you can filter through the weird people, it’s an excellent way to practice both your speaking and your listening. You also don’t have to have the camera on either and can choose to do just a voice chat. They also have a broadcasting feature where you can host your own little live audio show. For Hindi, Arabic, English, French and more, you can use the app called Wakie. It’s a phone-call app like the ones above, but with a wider audience. Also no camera, so you don’t need to be afraid of making mistakes at all. Shadowing means repeating what someone is saying. You can do this through any audio material, like the radio, a TV show, a podcast, or even music (though often, for tonal languages, tones are ignored when singing). Listen to slow news as well, such as News in Slow Japanese. By shadowing, you’ll get used to how native speakers speak, which in turn will make listening to them easier since you’ll be used to intonation and word usage. If you constantly listen to Japanese music, TV or radio, for example, you might hear a specific grammar structure being used and then you’ll say “Oh! I remember that. Now I see how it’s being used in daily conversation”. You’ll feel good about yourself and it’ll be easier to listen to native speakers. If you’re watching a YouTube video in your target language, you can slow down the speaking speed. You can also slow own audio on VLC. Another thing you can do is use the listening sections from standardized exams to hear slow audio. On YouTube, you can find tons of videos for JLPT listening, and the same can be said for the Korean TOPIK and Chinese HSK. The beginner levels are usually spoken slower, making it easy to hear the words clearly. Native speakers don’t sound like they do in textbooks! It’s important to learn filler words. In English, some filler words are “um”, “uh”, “well”, “hmm” and so forth. Similarly, other languages have their own unique ways of pausing during speech, and these often don’t appear in textbooks. You can look these words up, but the best way to learn them is by speaking or listening to natives. Watching TV shows in the language is also a wonderful way to pick up filler words. In Korean, Japanese and Chinese TV, you’ll often see filler words and sentences written on the screen like playful subtitles. These are good because you can hear the word and see it visually, helping solidify it into your memory. In closing, remember to make listening a part of your language-learning routine. Think of it as a workout. You can’t go to the gym and just do leg day every day. Your arms won’t be toned and your legs will be insane. You might be excellent at grammar and vocabulary but you may not have confidence to speak because you’ve never practiced speaking and listening. Everything is connected, so by practicing listening daily, you’ll be ingraining native grammar into your memory too. Just remember, practice makes permanent, not perfect… so make sure you check things with native speakers if you’re unsure!